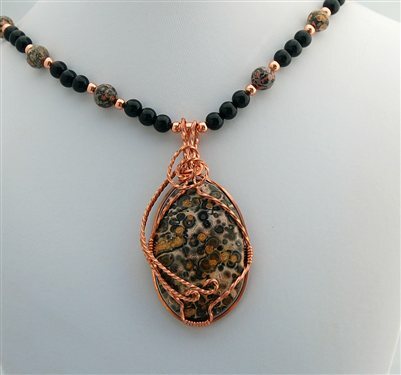 Fantastic leopard skin jasper focal cabochon wire wrapped in warm copper dangles from a stunning necklace of highly polished black onyx, leopard skin jasper and shinny copper. Rich browns, deep golds, black and yellow in a leopard spot matrix echos the colors and designs found on those wonderful wild cats. The copper wire accents and accentuates the colors in the focal stone. The pendant is 1 1/2 inches by 2 1/2 inches with a 2 3/4 inch drop. The coordinating necklace is approximately 18 1/2 inches long with a 3 inch hammered copper extender chain and a copper lobster clasp. FREE GIFT WRAP. Each piece of jewelry is wrapped in tissue paper and enclosed in an organza bag.